We've arranged a total package for you so that all you have to do is turn up and enjoy! Book yourself two nights in a self-contained cottage then add this package for a canoe adventure from Pipiriki back to the Flying Fox. Arrive at the Flying Fox and spend the afternoon exploring, take a swim in the river, walk to the nearby historic Koriniti Post Office, or perhaps enjoy a soak in a bush bath. Collect your lunch and take a scenic journey up the Whanganui River Rd with your driver. At Pipiriki you will be given a full safety briefing and equipped with everything you need to canoe safely back to the Flying Fox. This leisurely paddle down the river will take about 6 hours with time to stop and explore along the way. 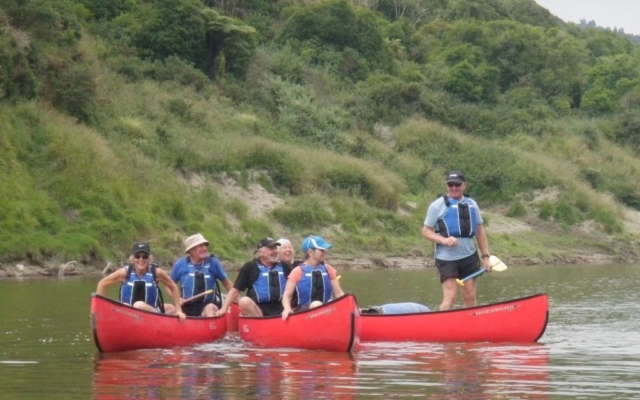 You will pass several historic settlements and sections of the Whanganui National Park, enjoy the breath taking scenery and serenity of the river. CATERING: Two continental breakfast baskets, one packed lunch. TRANSPORT: From the Flying Fox, enjoy a scenic drive up the Whanganui River Rd to Pipiriki. Our food hamper contains everything you need to prepare a simple dinner and continental breakfast for yourself. This option means you don’t have to worry about remembering to bring ingredients or make a decision about what to cook! Dinner will be served communally if more than one group are eating or we will bring it to your accommodation if yours is the only dinner booking. We offer the choice of a Continental or Cooked Breakfast. The cooked breakfast is served at a time to suit you between 7.30- 9am. This generally is a selection of bacon, sausages, black pudding, eggs, tomatoes, mushrooms, spinach, avocados, juice and toast with preserves. The Flying Fox provides a unique experience with eco-friendly accommodation on the banks of the Whanganui River. With no road access visitors arrive via aerial cable car across the river or land on the bank from jet boat or canoe. Situated in a sheltered river valley, on the site of an old Maori kainga (village), it enjoys a temperate climate suitable for growing an array of sub-tropical fruit. The site is mostly self-sufficient and has a large bank of solar panels, it's own water supply and composting toilets. There is no cell phone reception or TV making this a place to slow the pace of life and an ideal retreat. Free WiFi does enable you to keep in touch with the outside world should you need to. However this really is a place to relax, unwind and rejuvenate away from the pressures of the modern world. ** Please note our check in times are 2.30pm to 8pm (or if dark earlier, then earlier). We do not operate the cable car after dark. Walk the Atene Skyline track for breathtaking views. Starting your experience with a unique trip across the river in a cable car, this property allows visitors to experience one of the few remaining unspoiled areas of New Zealand. Here you are taking a step into a simpler way of life and allowing yourself to be soothed by the natural environment. Ruru Lodge overlooks the river in a garden setting with native forest as its backdrop. The house has a large lounge area, a fully equipped kitchen and covered decks where you can relax and eat. There is also a BBQ area and bush bath in the garden. The lounge has a log burner and the deck has roll down clear blinds and overhead infrared heaters so that you are comfortable in any weather. A private bathroom with shower and wash basin and a separate toilet come complete with a range of toiletries which are friendly both to your body and the environment. The Turret bedroom has doors which open onto a roof terrace with expansive views over the river. Ruru Lodge is available for rent between December and April. The cottage was named in memory of New Zealand’s famous poet James K Baxter, who spent time in the small community in nearby Hiruhārama (Jerusalem) and the Ahuahu valley commune. It houses our collection of James K Baxter’s poetry and literature along with a collection of artifacts donated by the nuns from the convent at Hiruhārama for those who have an interest. On the ground floor there is an open plan kitchen and lounge with comfy seating. The fully equipped kitchen with hob and oven mean self-catering is easy and the eclectic mix of CDs, LPs and books make relaxing a pleasure. From the second story bedroom vantage point you can relax on the balcony and enjoy the stunning views across the river to the hills opposite. Downstairs the bedroom area has a queen and king single bed, upstairs there is flexibility with the ability to have either three single beds or a king and a single. The porch and overhang keep this cottage cool in summer and the pot belly stove in the lounge makes it an ideal, cozy retreat for the cooler months. The River Boat Cottage was originally designed for the previous owner as a place to brew manuka beer but the charm of its recycled brick floor and macrocarpa interior ensured it soon became in demand as guest accommodation. A recent make-over has seen this cottage renamed to commemorate the river boats which used to travel the length of the Whanganui river providing a life-line to those living in the river valley and a transport link to the hinterland of the north island. Informative books, pictures and artifacts in the cottage tell the story for those who want to know more. A bedroom upstairs houses a queen bed and a small bunk room downstairs makes this ideal for couples looking for a romantic getaway or small families. The bathroom is accessed via an enclosed porch area which also houses a romantic wood-fired outdoor bath. The rear of the cottage has a covered deck with a view towards the citrus and avocado orchard and a backdrop of native bush clad hills. The outdoor setting is completed with seating both at the front and back of the cottage and a wood fired BBQ. Indoors, a fully equipped kitchen with hob and oven mean self-catering is easy and the eclectic mix of CDs, LPs and books make relaxing a pleasure. A wood burner turns this cottage into a cozy haven for the cooler months. This glamping accommodation consists of a quirky, hand built wooden cart which has a kitchenette at one end and a table with seating at the other. Adjoining the cart is a partly covered wooden deck area which has a large tent forming the bedroom and (at the other end of the deck) a small bathroom with toilet, shower and hand basin. The tent contains a double bed and the seating in the cart makes into a king single bed, making it possible to sleep three. The Gypsy Cart is set on the river bank with expansive views and is screened from the cottages by a stand of hazelnut trees, making for a secluded spot. The front of the tent opens up allowing you to lie in bed and watch the stars above the river whilst deer are often seen in the orchard to the rear! The kitchenette is fully equipped and has a small two burner gas hob and grill. A barbecue on the covered deck adds to the cooking facilities and makes self-catering a dream. Located in a quiet sunny spot in the orchard, this glamping option is a cozy ‘pop top’ trailer which has been restored with new canvas and furnishings. It has a small double bed, seating and a single bed in the trailer tent. The addition of a covered deck outside gives an ample seating area where you can enjoy the sun setting over the hills or watch the deer under the avocado trees as you enjoy an evening barbecue. A two burner hob completes your cooking facilities. There is a private toilet and small bathroom with a shower and hand basin adjacent to the trailer. Brand new for the summer of 2017/18, Bell Bird Corner is a 5m bell tent situated in a quiet corner of Koru Campsite. This is the ultimate ‘glamping’ experience – All the joys of camping with the comfort of a real bed and plenty of space! Bell Bird comes fully equipped with double bed and bedding, a sofa, towels, crockery and cutlery. Camp kitchen with running water and gas hob. Hot water shower and outdoor bath located in the bush. All the accommodation options at the Flying Fox are fully equipped for you to self-cater with gas hobs, ovens (in the cottages) and BBQs. There is also a small store on site for basic provisions that you may have forgotten (along with home made treats, beer and wine). During the summer months we also have a snack menu available between 11am and 4pm. However full catering can also be provided with dinner, breakfast and packed lunch options. Jane and Kelly pride themselves on providing good wholesome, home cooked meals, created using fresh, home grown or locally sourced ingredients with an emphasis on free range and additive free produce. Please add as an 'extra' should you wish to include these with your booking. You will be guaranteed a warm welcome from husband and wife owners Jane and Kelly and invited to share their piece of paradise, nestled on the edge of the Whanganui National Park.